INFORMATION & REGISTRA TION OPEN! - Ages 9 to 19 (28 Training sessions / 2 hour 30' training session). (6/11, 6/12, 6/13, 6/18, 6/19, 6/20, 6/25, 6/26, 6/27, 7/2, 7/3, 7/9, 7/10, 7/11, 7/16, 7/17, 7/18, 7/23, 7/24, 7/25, 7/30, 8/1, 8/6, 8/7, 8/8, 8/13, 8/14/, 8/15). What to Bring: Official TOCA Practice Jersey, Soccer Shoes, Shin-guards, Soccer Ball and Water-bottle. 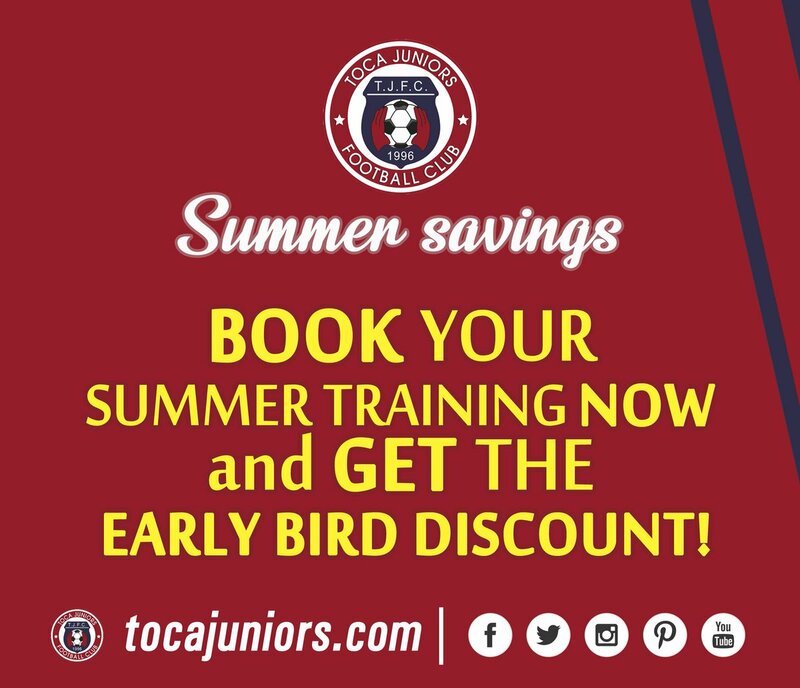 BOOK YOUR SUMMER TRAINING NOW & GET THE EARLY BIRD DISCOUNT!